Many a year has passed since Paul Weitz’s screenplay and directorial debut of AMERICAN PIE (1999), and his penning, directing or producing of such memorable films as ABOUT A BOY, IN GOOD COMPANY, NICK & NORAH’s INFINITE PLAYLIST and BEING FLYNN. 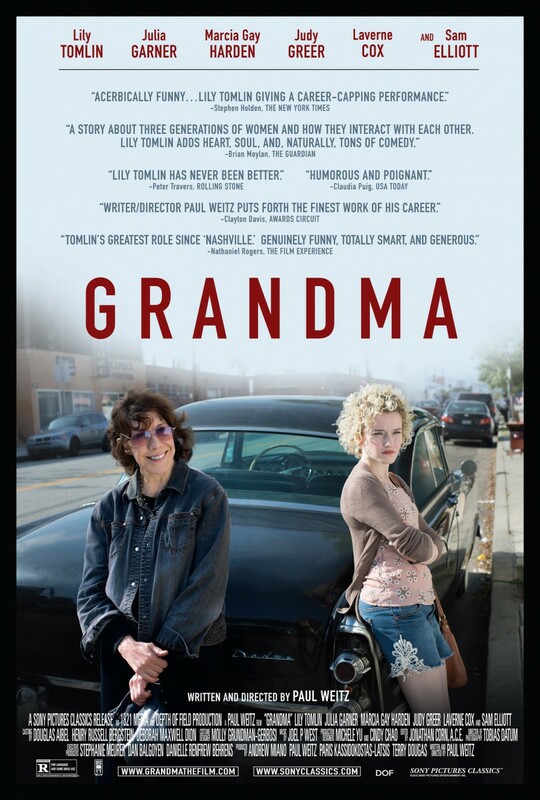 So it comes as no surprise that he is enticing us once again with his quirky writing and directing prowess, taking on subject matter that is deeply rooted in our AMERICAN WAY OF LIFE…with his latest endeavor ~ GRANDMA!!! When granddaughter Sage (Julia Garner) just happens to stop by, she discloses that she is in need of her grandmother’s help, as she is pregnant, and needs a chunk of cash ~ $600 to be exact ~ for an abortion. Forced to bring her daughter Judy (Marcia Gay Harden) into this mess, even though her granddaughter would prefer any other option, Elle is forced to face the world’s outside views on her “life style”, her granddaughter’s choice to have an abortion, and the condescension and crappy attitude her own daughter is casting in her direction too…AIN”T LIFE GRAND!!! !